Tweets: Under Pressure — Service Director Testifies : It's All Politics Secret Service Director Joseph Clancy takes to Capitol Hill and faces tough questions about the agency's latest scandal. U.S. Secret Service Director Joseph Clancy pauses as he testifies during a House Appropriations subcommittee hearing on Capitol Hill on Tuesday. 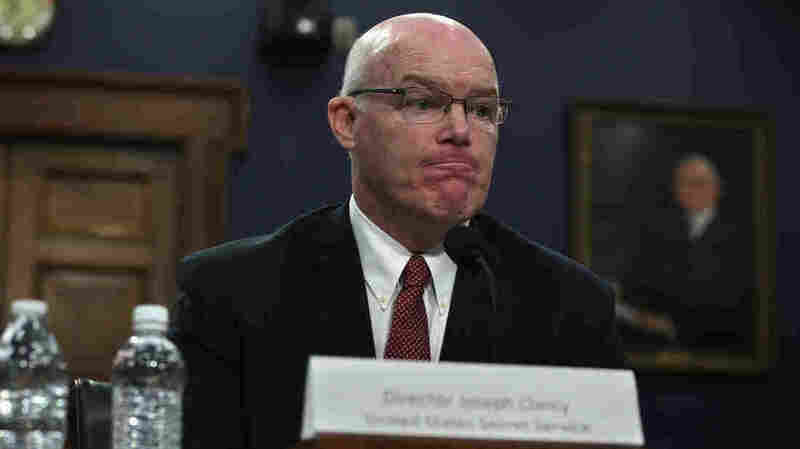 Appearing before the House Appropriations Subcommittee on Homeland Security, Secret Service Director Joseph Clancy fielded questions about his agency's latest scandal. Two weeks ago, two senior officers struck a White House barrier with a government car after they had allegedly been drinking at a party. At Tuesday's hearing, Clancy admitted he wasn't told about the incident until days after it happened. He was called to Capitol Hill to talk about the Secret Service budget, but committee members hammered him on the agency's now long-running issues with security breaches and officer discipline.